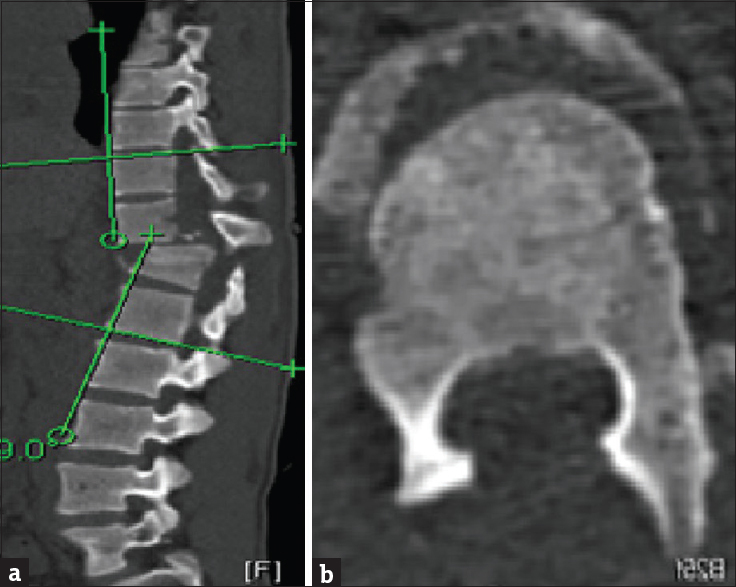 Pediatric thoracolumbar spine fractures are considered rare injuries with paucity of publication across the globe. Further, spine injuries in children are comparatively rarer, and pediatric spine differs from adults, both biomechanically and anatomically; so, adult spine management strategy cannot be applied to pediatric cases, and exact guidelines for management of pediatric spinal injury is lacking. The current study is undertaken to study epidemiology, surgical management, and outcome of pediatric dorsolumbar unstable spine injury. A total of 25 pediatric patients were analyzed retrospectively with thoracic, thoracolumbar junction and lumbar spine injuries, who were managed surgically at our institute since June 2008, formed the cohort of the present study. There were 19 males and six females with a mean age 14.8 years. Clinically, complete spinal cord injuries were observed in 11 (44%), and rest 14 had incomplete injury. Most common mode of injury was fall (76%) in contrast to the western countries and the thoracolumbar junction was the most common affected site. Among all patients who underwent surgical intervention, 68% cases had posterior decompression and pedicle screw fixation. Mean duration of hospital stay was 18 ± 31 days. The mean follow-up period was 13.83 ± 5.97 months. In incomplete neurological injury group, a total of 13 patients showed neurological improvement, out of which four cases improved by two Frankel grades, eight patients improved by at least 1 grade, and rest one by Grade 3 (Frankel Grade B to E). Neurological outcome was statistically significant in relation to the level of fracture (P - 0.03) and preoperative Frankel grade, however, other factors, for example, gender, mode of injury, type of fracture, various surgical approaches with instrumentation, and correction of kyphotic deformity were found to be statistically nonsignificant. Surgical management of unstable pediatric dorsolumbar spine is a safe and an effective procedure which can provide good neurological outcome. The current study is one of largest series of cases managed surgically in this part of the world. There is increasing evidence that maternal diabetes mellitus during the pregnancy is associated with a higher risk of neurodevelopmental and neurofunctional anomalies including motor dysfunctions, learning deficits, and behavioral problems in offspring. The cerebellum is a part of the brain that has long been recognized as a center of movement balance and motor coordination. Moreover, recent studies in humans and animals have also implicated the cerebellum in cognitive processing, sensory discrimination, attention, and learning and memory. Synaptogenesis is one of the most crucial events during the development of the central nervous system. Synaptophysin (SYP) is an integral membrane protein of synaptic vesicles and is considered to be a marker for synaptic density and synaptogenesis. Here, we review the manuscripts focusing on the negative impacts of maternal diabetes in pregnancy on the expression or localization of SYP in the developing cerebellar cortex. We believe that the alteration in synaptogenesis or synapse density may be part of the cascade of events through which diabetes in pregnant women affects the newborn's cerebellum. Objective: Progress in the diagnosis and treatment of childhood neoplasm in the past few decades is one of the most gratifying achievements in the field of oncology. This study was aimed to ascertain the burden (incidence and prevalence) and histopathologic features of neurogenic tumors occurring in the pediatric population. Materials and Methods: The study evaluated a total of 492 cases of pediatric tumors over a period of 8 years from 2007 to 2015, including patients of 0–12 years of age group; attending the out-patients and in-patients Department of Pediatrics and Pediatric Surgery at Jawaharlal Nehru Medical College, AMU, Aligarh, with the complaints of tumor or tumor associated sign and symptoms. Clinical profile, hematological and histopathological examination along with immunohistochemical analysis were implicated to attain a conclusive diagnosis. Result: Out of 492 pediatric tumor cases, 255 (52%) cases were benign and 237 (48%) cases were malignant. 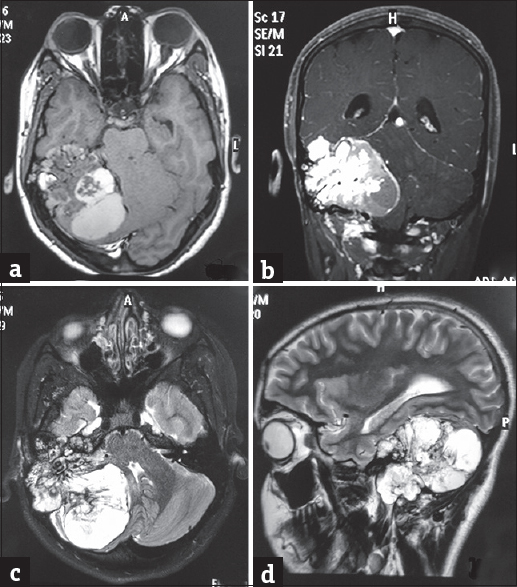 Neurogenic tumor (brain tumors) comprised 49 (10%) of the total case, being most common malignant solid neoplasm and second most common (next to leukemia) overall malignancy, constituting 49/237 (21%) cases. 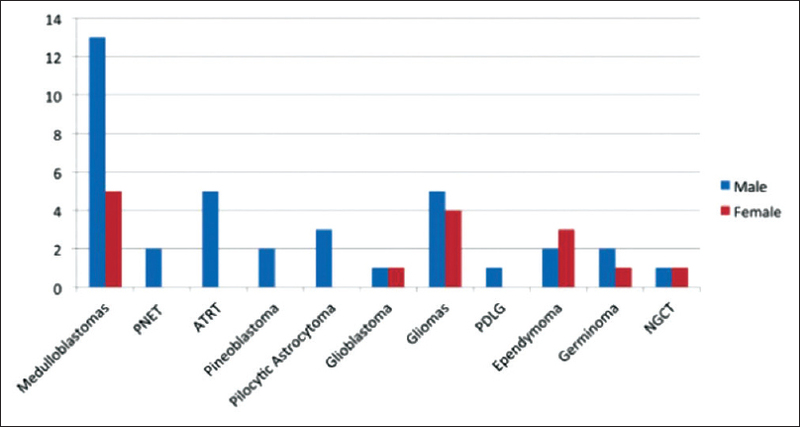 Astrocytoma 22/49 (45%) cases were the most common type brain tumor followed by medulloblastoma 15/49 (31%), ependymoma 9/49 (18%), and craniopharyngioma 3/49 (6%). Conclusion: Effective management of pediatric neurogenic tumor is a multipronged approach involving effort of good Pediatric neurosurgeon, Pathologist and a host of Oncology specialists with insight into childhood neoplasms. Introduction: The deformed joints seen in congenital atlantoaxial dislocation (CAAD) are often associated with vascular anomalies. It is important to identify these vascular anomalies and address them appropriately without compromising the manipulation and fusion of C1–C2 joints. The small bones in pediatric age group pose an additional challenge. Materials and Methods: Data of fifty-six children with CAAD operated in the last 4 years was analyzed. A computed tomography angiogram was obtained preoperatively to assess for the course of the third segment of vertebral artery (VA). The anomalous VA was dissected and safeguarded during drilling and manipulation of the C1–C2 joints. Results: Of the 112 VAs, 5 were aplastic, 21 crossed the joint posteriorly. Only one patient with reducible atlantoaxial dislocation (AAD) had anomalous VA crossing the joint posteriorly, the remaining VA anomalies were seen with irreducible AAD. Anomalous VA was seen on both sides in 2 patients. The most common anomaly was an inverted VA seen in seven sides. In all patients, the anomalous VA could be dissected and safeguarded without compromising the C1–C2 dissection and manipulation and fusion. In children, even the normal VA may occasionally pose difficulties while manipulation of joints. Challenges while addressing the anomalous and normal VA in pediatric age group have been described. Techniques to overcome these have been discussed. Conclusion: It is important to delineate the anomalous VA. However, the presence of such an artery is not a deterrent to the manipulation of C1–C2 joint, essential for best results. Special attention needs to be paid to the extent of distraction, medial C2 transverse foramen, and dissection/drilling of the area superior to the anomalous VA in the pediatric age group. Background: Infantile tremor syndrome (ITS) is a clinical syndrome of acute or gradual onset of mental and psychomotor changes, pigmentary disturbances of hair and skin, pallor, and tremors in malnourished children aged between 5 months and 3 years. It is a well-known entity, but the exact etiopathogenesis is still not known. Setting and Design: Prospective observational study carried out in the Department of Pediatrics at Dr RPGMC Tanda, Kangra in Himachal Pradesh. 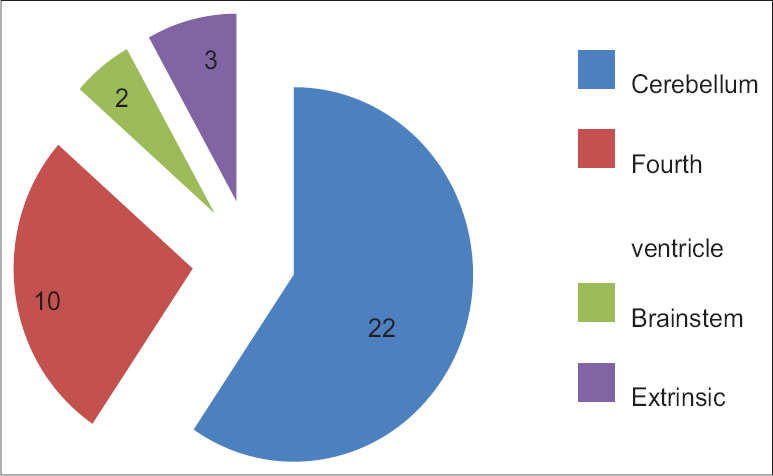 Materials and Methods: Demographic, clinical, and laboratory profile of 25 children with the diagnosis of preinfantile and ITS was collected who were admitted from May 2014 to June 2015. Statistical Analysis: Descriptive analysis was performed using SPSS 17 trial version. Results: These children accounted for 0.5% of total pediatric admissions. Median, standard deviation age was 10, 3.1 months. Male to female ratio was 1.27:1. 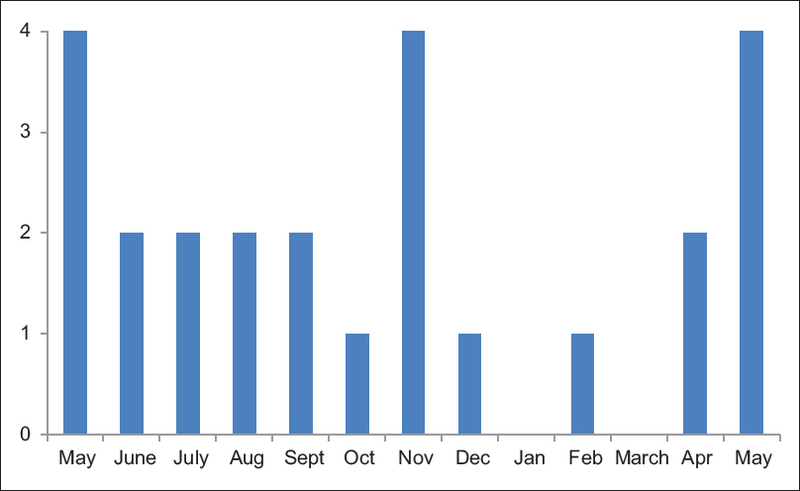 Cases were present throughout the year with two peaks observed in the months of May and November. This disease was found to be more common in higher birth order (68%). Complementary feeding, that too improper, was initiated in only 4 cases (16%). Ninety-six percent cases presented with comorbid illnesses. Respiratory tract infection was the most common association, followed by urinary tract infection. There was moderate anemia with dimorphic picture (40%). Thirteen (52%) had vitamin B12 levels below normal. Magnesium levels, though statistically insignificant (P = 0.8) were lower in patients with tremors. Conclusion: This is a disease of multi-micronutrient deficiency, which can be present either alone or in association. Educating women about proper nutrition during pregnancy and timely administration of complementary feeding is of utmost importance. Context: Tumors of the central nervous system (CNS) constitute the second most common pediatric cancers. Unlike leukemia, management of CNS tumors requires a good multidisciplinary team. Higher rates of treatment abandonment are documented in view of complexity of the treatment with long duration, involving neurosurgery, radiation, chemotherapy, and high cost of treatment. Morbidity associated with CNS tumors may be significant in terms of physical deficits as well as neuropsychological and neuroendocrine sequelae. Pediatric neurooncology is still at a very nascent stage in the developing countries. There are only a few reports on the multidisciplinary approach and outcomes of pediatric brain tumors in developing countries. Aims: The aim of this study is to identify the clinicopathological profile of Pediatric CNS tumors in a tertiary care center located in South India in comparison with reports from other low-and middle-income Countries. Settings and Design: A retrospective analysis of medical records of all children diagnosed with brain tumors from January 2012 to November 2016 at our institute was done. Subjects and Methods: A retrospective study of clinical, pathological profile, and outcomes of children <18 years diagnosed with brain tumors at our institute from January 2012 to November 2016 was done. Histopathological categorization was done as per the WHO classification 2007. The multidisciplinary treatment with respect to surgery, radiation, and chemotherapy was noted and the outcomes were recorded. Statistical Analysis Used: R for Statistical Computing (Version 3.0.2; 2013-09-25). Results: A total of 52 children were diagnosed with male preponderance of 66.6%. Highest incidence was noted in the age group of 0–4 years (50%). Majority of them were supratentorial (59.6%). CNS embryonal tumors contributed to 48% of all our brain tumors. 73% of them underwent either resection or biopsy. Eight (15.3%) of them died due to the progression of disease, but 44% abandoned treatment due to the progression/recurrence of disease. Those lost to follow-up were mostly among the high-risk groups with poor prognosis such as pontine glioma, medulloblastoma (high risk), and primitive neuroectodermal tumor. Conclusions: Although brain tumors constituted 30% of all our solid tumors, only 56% of them received appropriate treatment and 25% abandoned treatment. High rates of abandonment were a consequence of late diagnosis, complex multidisciplinary treatment involved, high treatment cost, lack of uniformity in management between different oncology centers and poor prognosis of the tumor subtype. Context: Brain tumor is one of the most devastating forms of human illness, especially when occurring in the posterior fossa and involving the brainstem. Tumors in the posterior fossa are considered some of the most critical brain lesions. This is primarily due to the limited space within the posterior fossa, as well as the potential involvement of the vital brainstem nuclei. 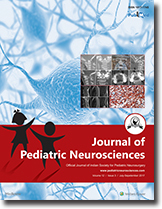 Aims: The aim of this study is to analyze the incidence, clinical features, surgical outcome, complications, and prognosis in a series of 37 pediatric patients with posterior fossa tumors who underwent surgery between September 2012 and January 2015 from the Department of Neurosurgery, King George Hospital, Visakhapatnam (both prospective and retrospective study). Materials and Methods: A series of 37 cases were treated by the Department of Neurosurgery, King George Hospital, between August 2012 and January 2015. Results: Posterior fossa tumors are predominantly seen in children with a peak incidence in the first decade. The most common presenting symptoms are raised intracranial pressure with headache and vomiting. Majority of the tumors are medulloblastomas, ependymomas, and cerebellar astrocytomas. The most common location is the cerebellar vermis, followed by the cerebellar hemispheres, followed by the forth ventricle and then the brainstem. Background: Quality of life (QOL) in children with cerebral palsy (CP) needs to be measure by CP-specific questionnaire. CP-QOL questionnaire is being used for this purpose. Objectives: The aim is to determine the QOL in Indian children with CP using CP-QOL questionnaire and to correlate QOL scores with demographic details of the patient. Materials and Methods: Subjects were parents of 50 children (4–12 years) attending child development center of Guru Teg Bahadur Hospital were enrolled. The parent–proxy version of the CP-QOL questionnaire translated into Hindi was administered by one author. Scoring and analysis were performed as per specified method. Cronbach's alpha was calculated for each domain for validation. Effect of clinical and demographic profile on QOL was analyzed. Results: CP-QOL questionnaire was administered to 50 parents of CP children (32 males, 18 females). The overall QOL score of the children studied was computed to be 38.29 ± 5.2. Age and maternal education had a significant bearing on the QOL of the children (P < 0.05). Type of CP, gender, and epilepsy did not affect the QOL significantly (P > 0.05). Good internal consistency and reliability were found in the domains of social well-being and acceptance, functioning, participation, and physical health (Cronbach's alpha >0.7). Access to services, pain, and impact of disability and family health showed a weak correlation with Cronbach's alpha <0.7. Conclusion: QOL in children with CP was compromised. The CP-QOL questionnaire can be used to measure QOL in Indian children with CP. Purpose: To analyze quality of life of children operated for congenital hydrocephalus and the concern of parents in taking care of these children. Methods: Thirty patients who underwent ventriculo-peritoneal shunt were randomly selected with minimum gap of 1 year between surgery and study. Canadian validated questionnaire was used. 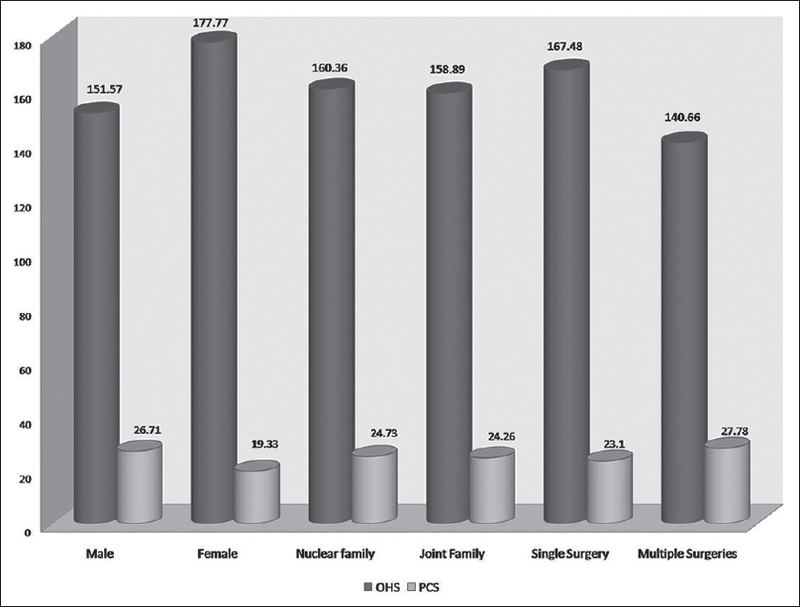 Overall health score (OHS) and parental concern score (PCS) were correlated with gender, family type and number of surgeries. Results: Mean OHS was 159.43 which was summation of physical health (mean 45.76), social-emotional (mean 80.03) and cognitive health scores (mean 33.66). Mean OHS was 151.57 for males and 177.77 for females (p-value 0.233). Nuclear and joint families had mean OHS of 160.36 and 158.89 respectively (p-value 0.944). Those who underwent one surgery had mean OHS of 167.48 and PCS of 23.10 whereas mean OHS was 140.66 and PCS was 27.78 for those with multiple procedures. Mean PCS for males was 26.71 and for females was 19.33 (p-value 0.036 statistically significant). This was not statistically significant between nuclear (24.73) and joint families (24.26). Conclusions: Quality of life of survivors of hydrocephalus is reasonably good even in developing countries due to keen parental involvement irrespective of gender, family type and number of surgeries. 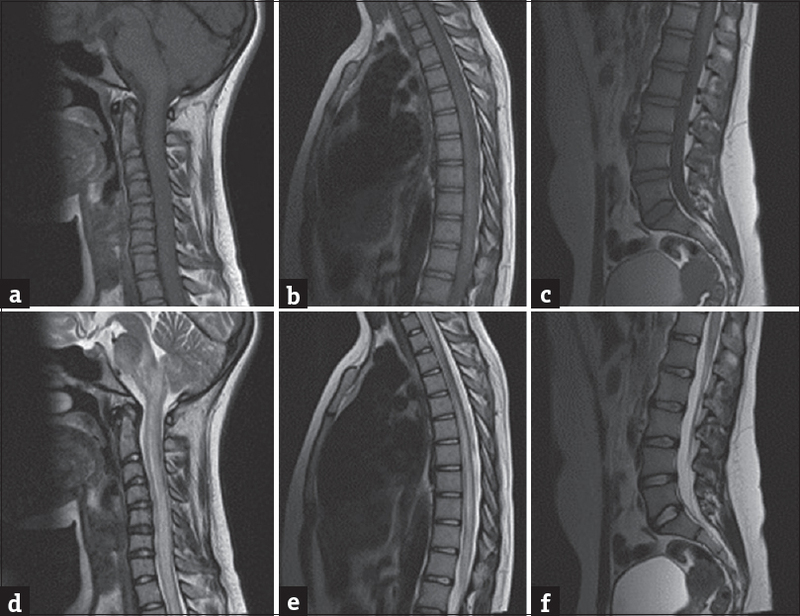 Longitudinally extensive transverse myelitis (LETM) is defined as an inflammatory lesion of the spinal cord that extends to three or more segments. LETM is a commonly characteristic feature of neuromyelitis optica (NMO) or various autoimmune diseases. Manifestation of Mycobacterium tuberculosis (MTB) infection with LETM are rare and usually in the cervicothoracic spinal cord. Our patient presented with holocord LETM, so NMO was considered initially diagnosis. After in further research, MTB was diagnosed and treated successfully. The current case underscores that tuberculosis must be keep in mind when undertaking differential diagnosis of demyelinating diseases even in the absence of symptoms of infection, and especially in endemic regions. Intradiploic epidermoid cyst is an uncommonly occurring neoplasm, and only about 200 cases are reported in the form of isolated case report. It is presumed to occur due to ectodermal cells in inclusion in the bone tissue during embryonic life neural tube closure. It commonly remains asymptomatic or rarely presents as a bony lump in the skull bone. Authors report present an interesting case, which presented with swelling, and underwent successful surgical resection. Pertinent literature along with diagnosis and management is briefly reviewed. These lesions can erode the bone and involve the brain parenchyma due to their proximity to the brain. Radiological imaging is very helpful in accurate diagnosis of these lesions and in differentiating intradural from intradiploic varieties of epidermoid. We present an unusual case of this pathology. Pyruvate dehydrogenase complex (PDHC) deficiency is a rare metabolic disorder that affects tissues with high energy demand such as the central nervous system. 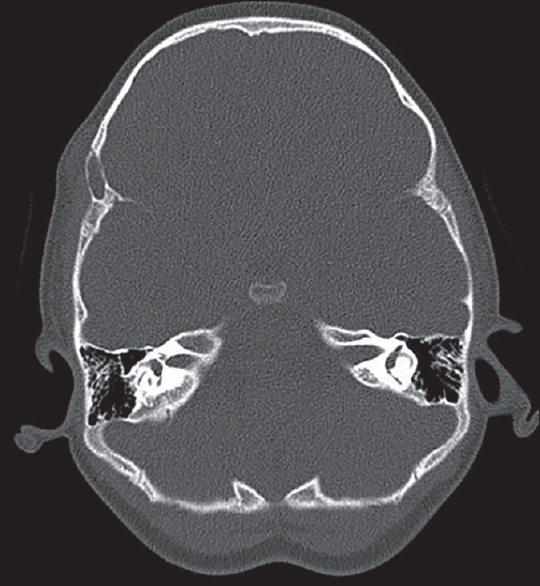 The clinico-radiological phenotype of Leigh's disease is one of its common presentations. 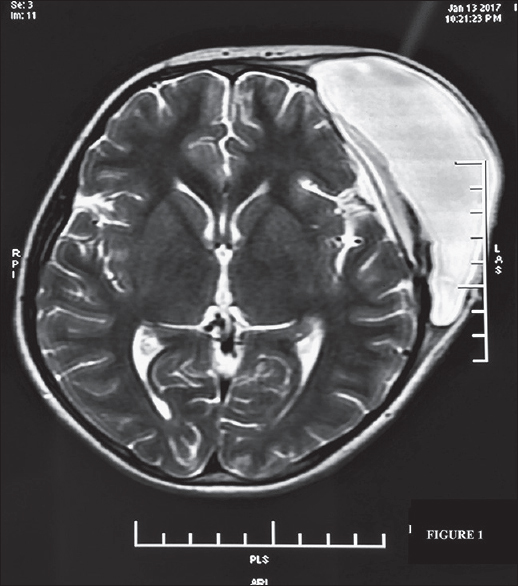 We present a 9-month-old boy with rapidly progressive infantile Leigh's disease. PDHA1 gene sequencing revealed a pathological homozygous missense mutation c.131A>G or p.H44R in exon 3 consistent with PDHC deficiency. H44R is among the five mutations (H44R, R88S, G89S, R263G, and V389fs) in E1α subunit that is thiamine-responsive. The child was initiated on thiamine, riboflavin, carnitine, coenzyme Q, and sodium benzoate supplementation. 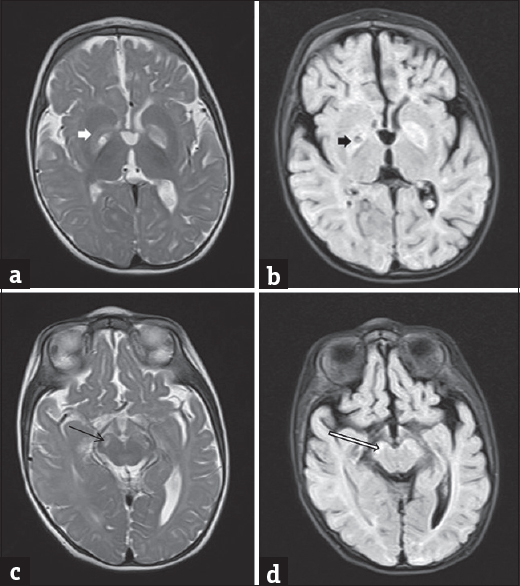 Mild recovery was noted at 6 months follow up as no further episodes of encephalopathy occurred. Thereafter, the child was treated with Ketogenic diet which resulted in increased levels of activity and alertness. Despite an improving course, the child had a sudden unexpected death at the age of 21 months. The presence of giant occipital encephalocele represents a surgical challenge. However, preoperative magnetic resonance imaging with venography can help in delineating relation of venous sinus, content of the sac and help classify occipital encephalocele into infra-torcular and torcular depending on the relation with position of torcula. However, the presence of old hemorrhage into encephalocele sac is extremely rare and in the detailed PubMed search, the authors could find one such case, reported by Nath et al. The author reports a case of giant occipital encephalocele; during surgery, evidence of old bleed was noted. Pertinent literature and management are reviewed briefly. Subaponeurotic cerebrospinal fluid (CSF) collection is a rare condition. 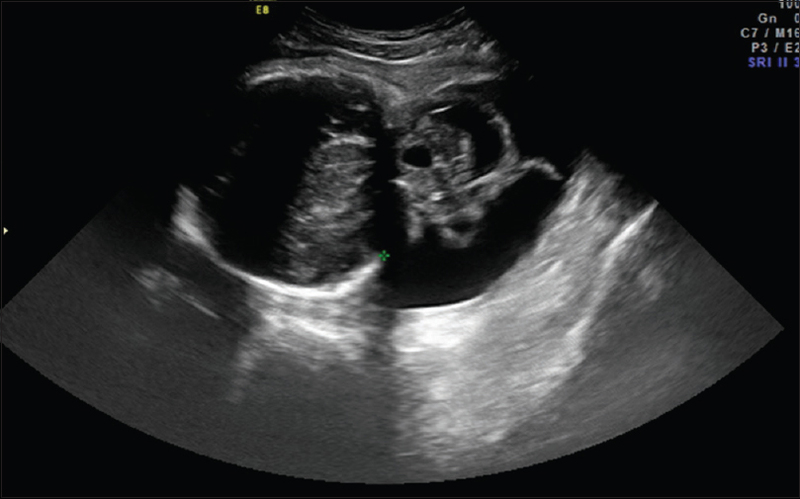 We report a 13-week-old male infant who presented with a swelling in the occipitoparietal region of 4 h duration. Swelling was soft, fluctuant, and contained CSF. It was tapped twice on the 4th and 8th day of appearance and resolved completely by 7 weeks. The condition is benign, and a conservative approach is recommended. Ewing's sarcoma primarily involving the skull is an unusual occurrence (1% of all Ewing's sarcoma cases) with very few reported cases in the published literature. The challenge in such cases is to establish a definitive diagnosis before starting the multidisciplinary treatment approach. We report such a rare case in a 13-year-old boy who is being treated at our institute with an intention of adding to the limited information we currently have on diagnosis, management, and the outcome of such cases. Polydactyly is a relatively common abnormality in infants. However, it can be a marker of a wide variety of neurological and systemic abnormality. Hence, it is important for pediatrician and physician to have insight into the various association of this apparently innocuous anomaly. In this write-up, we report an extremely rare syndrome associated with polydactyly that is Pallister–Hall syndrome. A 10-month-old male child born by lower segment cesarean section presented with global delay associated with microcephaly, frontal bossing, hypertelorism, flat nose, short philtrum, incomplete cleft in the upper lip and hard palate, polydactyly, and syndactyly. The child presented with repeated vomiting and crying episodes. The patient was investigated which revealed a hypothalamic hamartomas. Pallister–Hall syndrome is a very rare autosomal dominant genetic disorder due to mutation in GLI3 gene in the short arm of chromosome 7 with variable penetrance and expressivity. Arachnoid cysts are benign developmental anomalies representing 1% of all intracranial lesions. 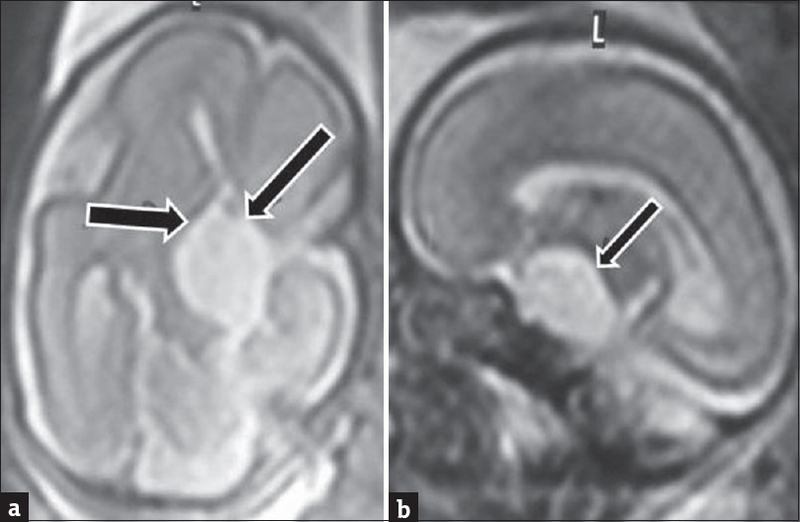 Suprasellar prepontine location of arachnoid cyst in the perinatal period has been reported in the perinatal period with the advent of prenatal imaging. 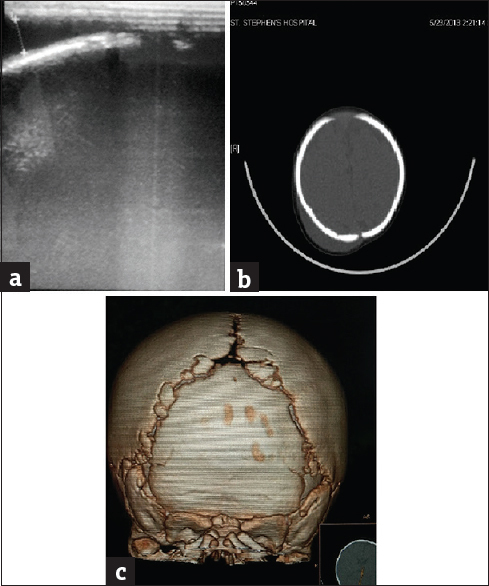 A rare case of rapidly enlarging suprasellar prepontine arachnoid cyst diagnosed at 28 weeks on routine antenatal ultrasonographic and magnetic resonance imaging is presented. Rapid enlargement of the cyst near term led to endoscopic fenestration of the cyst and ventriculocystocisternostomy followed by ventriculoperitoneal shunt in the postnatal life. Serial imaging in the perinatal period led to early intervention with good postnatal outcome. We also review all cases of prenatal suprasellar prepontine arachnoid cyst mentioned in literature and discuss the management strategies. Abdominal complications after ventriculoperitoneal (VP) shunt surgery for hydrocephalus have been known to occur. The more common complications include peritoneal pseudocyst, obstruction of the lower end, and shunt infection. Perforations of the intra-abdominal hollow viscera leading to spontaneous extrusions of the peritoneal catheter via the natural orifices have also been reported. A rarer phenomenon still is the migration of the lower end of the VP shunt through the anterior abdominal wall, leading to the formation of a spontaneous umbilical fistula at a site unrelated to the surgical site. Eight cases have been described in the literature so far with various causes elucidated. We report this condition in a child 4.5 years after his shunt surgery and postulate different mechanisms for both early and late presentations of this condition. Schimmelpenning-Feuerstein-Mims syndrome is a congenital neurocutaneous disorder, comprising of organoid epidermal nevus with a broad spectrum of multiorgan dysfunction (neurologic, skeletal, cardiovascular, ophthalmic, and urologic) secondary to postzygotic mutation in the early embryonic period. Predominant neurological manifestations include epilepsy, intellectual impairment, and focal deficits. Here, we report a 3-year-old girl who presented with epileptic spasms and had a characteristic linear sebaceous nevus. This report not only highlights the importance of early diagnosis of this condition but also emphasizes the need for multiorgan screening in children with seizures and nevi. Traumatic isolated divisional oculomotor nerve palsy has not been reported following mild head injury. We present an interesting case of a 10-year-old male boy who presented with right-sided ptosis, upgaze palsy, and horizontal nystagmus following a mild head trauma. Magnetic resonance imaging showed right superior rectus muscle atrophy. After observing for 6 months, right inferior rectus recession was done. The abnormal head posture and diplopia got corrected, but nystagmus persisted, although with appreciably decreased amplitude. We here report a rare case of an isolated superior divisional oculomotor nerve palsy following mild head trauma. Nystagmus accompanying a divisional oculomotor nerve palsy has never been reported before, making this case more unique. A critical step-wise approach to the case with possible mechanisms are discussed. 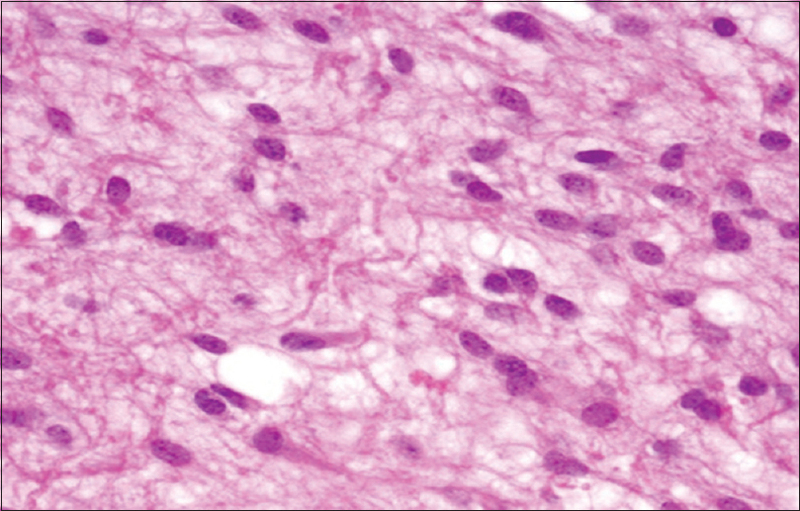 Endolymphatic sac tumor (ELST) is a rare papillary neoplasm with locally destructive behavior which can occur sporadically or in association with Von Hippel–Lindau (VHL) disease. We herein present a case of ELST associated with VHL disease in a 14-year-old girl and discuss clinico-radiological, immunohistopathologic findings, and management by staged surgery and postoperative radiotherapy to the residual lesion.